As one contemplates the panoramas of red vineyards and walks rows to find disturbingly few completely asymptomatic plants, it is easy to consider a null hypothesis suggested by early notions that red blotch has been around a long time masked by similar symptoms in other viruses, and Dr. Golino’s recent finding that a substantially similar virus existed in Sonoma County in 1940. A null hypothesis could be that the virus has been here latent in every plant forever and the near universal expression of symptoms this year is the result of unknown cyclic or environmental factors. This possibility cannot be completely ruled out, but a number of observations about the current outbreak argue against it. 1. Dr. Sudarshana has documented the spread of the virus to plants that previously tested negative at the U.C. Oakville field station. 2. The pronounced edge effect. There is no reason to expect an edge effect unless a new strain or vector relationship has developed. 3. The existence of “one armed” symptoms on cordoned vines. One would expect a widely distributed latent infection to be evenly expressed in the plant. 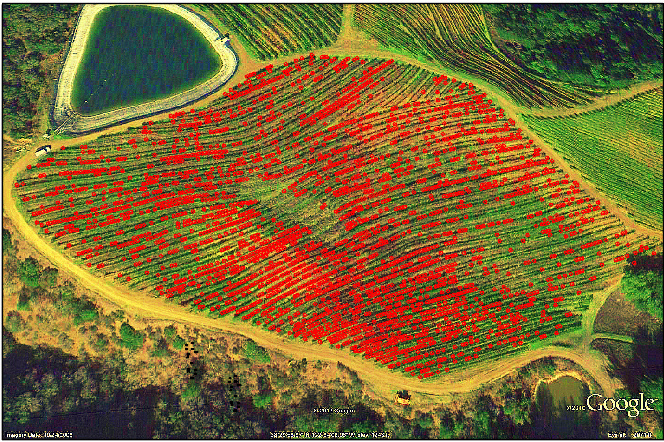 We present here possible evidence of symptom evolution in an isolated mountain vineyard block. If our interpretation is correct, this evidence would further argue against the null hypothesis. 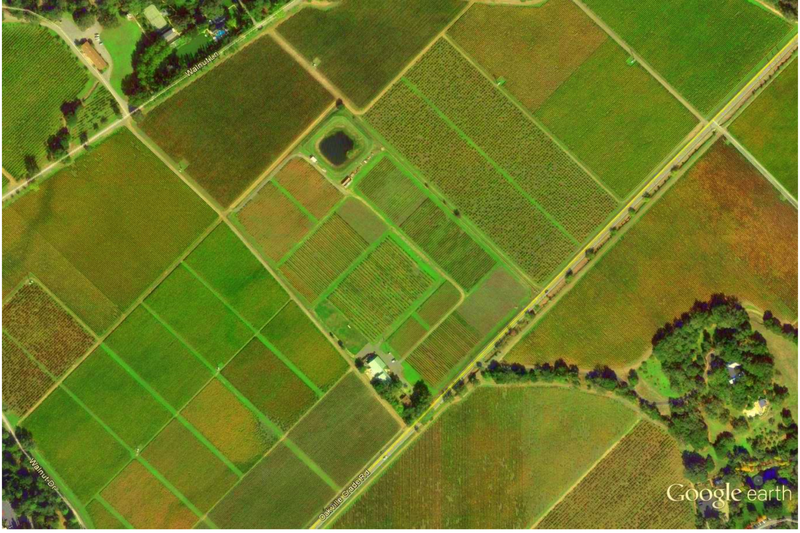 Google Earth imagery lacked the resolution for any detailed analysis until about 2008 when a significant resolution upgrade seems to have occurred. 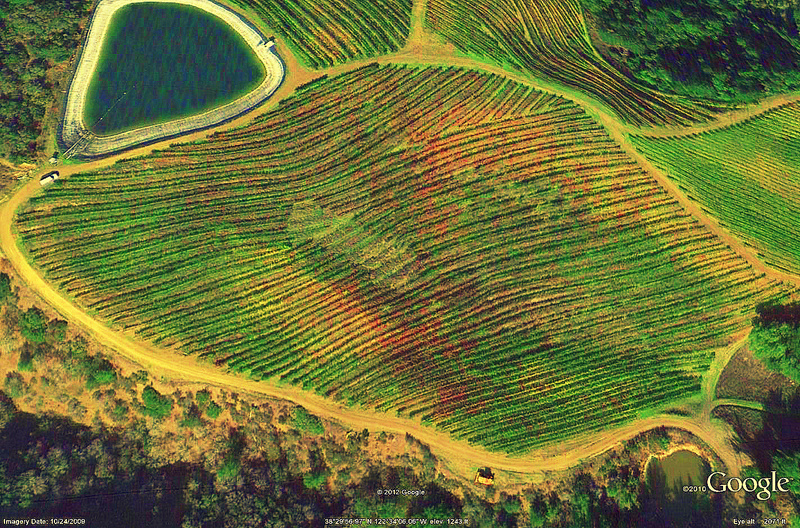 The usefulness of this imagery is also limited because the photography needs to happen during the symptomatic stages of red blotch which in most vineyards is from September to November. Such photography took place on October 24, 2009. The resolution is still far less than ideal. Close examination reveals pixelation on the order of ten feet which represents two vines in this vineyard. Additional uncertainty of one position is introduced by the way AutoCAD allocates points along a polyline that extends around corners as this block was counted. In the strictest sense this data could be written off as statistically meaningless. Nevertheless, photons tell no lies. When an otherwise green vineyard registers red and purple areas and appropriate margins of error are incorporated, it may well be possible to derive significant results. In our opinion we are not to the stage of this investigation where any evidence can be ignored unless it is demonstrably wrong. Below are three pictures of the Oakville Field Station 10-24-09. The first, a native image, shows a gross infection, possibly with several viruses, and a progressive infection in neighboring vineyards. 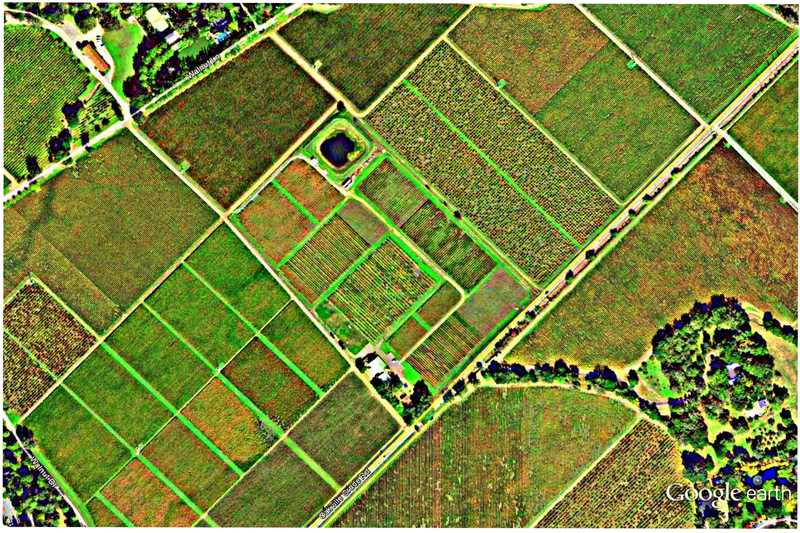 The second image is saturated in Picassa and more detail of the surrounding vineyards and hints of infection within the Station can be found. The third image is boosted with high dynamic range which becomes granular but polarizes green and red. This clearly shows edge effects. It is difficult to separate “edge” effects from “road” effects as edges are nearly always roads. 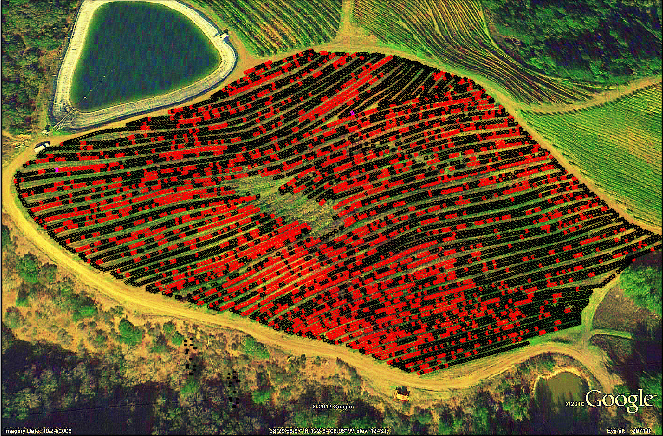 Moving to a remote mountain vineyard using a base image similarly enhanced from the same day, October 24, 2009, we show the block suspected of being ground zero. We find no apparent edge effect in play. This block is CS337 on 44-53 rootstock. The rootstock was thermally sterilized and propagated on site from cuttings procured in Oregon about the turn of the millennium. The 337 from numerous sources was field grafted. The partial block above and to the right also showing symptoms is CS4 on 44-53. The asymptomatic partial block to the right is CS4 on 1103P and remains one of the least symptomatic blocks today. This year we marked the vines we judged to be grossly symptomatic defined as over 50% red. 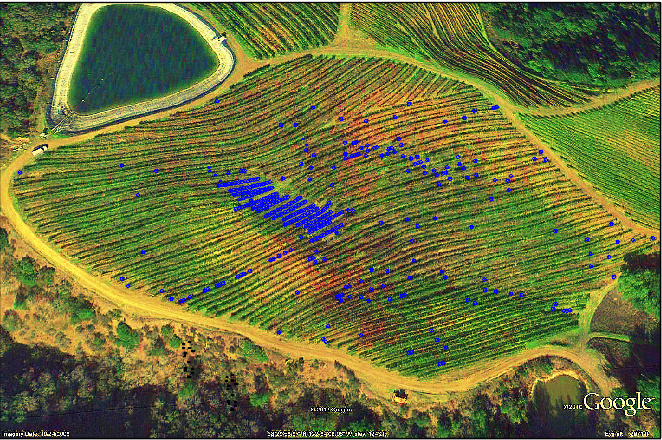 Here they are superimposed over the same image as 5′ diameter circles in accordance with vineyard spacing. There is a slide in the middle where vines were removed. Once again we find no edge effect. When the less symptomatic vines are removed (it should be noted that it is very difficult to find completely asymptomatic vines in this block), we find a poor correspondence between the grossly symptomatic vines this year and those from 2009. Although symptoms are progressive and great caution must be exercised comparing different seasons and mapping dates, we feel that this at least leaves open the possibility that vines develop resistance over time. There are no surviving tissue samples so there is no way to be certain the symptoms from 2009 were GRBaV, but all qPCR assays from this block and the entire vineyard to date indicate the presence of only GRBaV and RSPaV. We take this analysis one step further with a look at dead and missing vines. The slide and the sorry row where machinery was moved in are apparent, but again we find poor correspondence with vines symptomatic in 2009. We find therefore no evidence of increased mortality. We must constantly remember that our minds are wired to find patterns and conclusions from insufficient information. Yet it strikes us that edge and/or road effects are key to understanding the recent explosion of symptoms in Northern California. 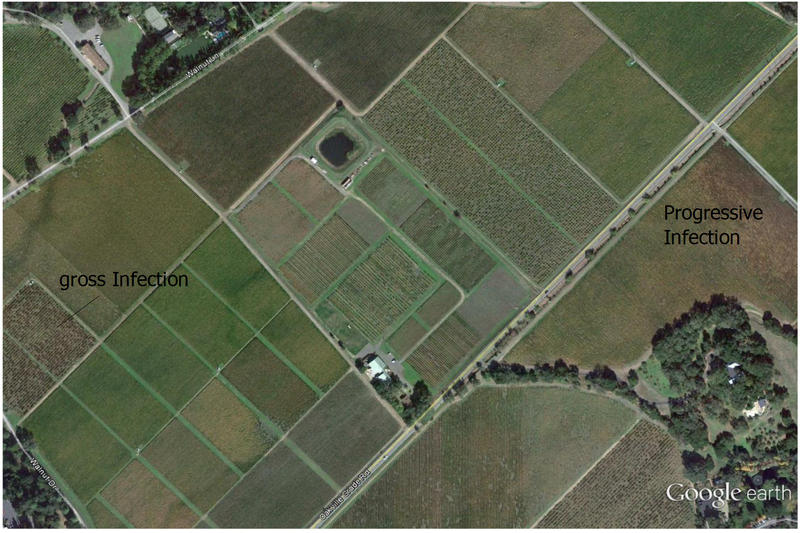 Other blocks in this vineyard show striking edge/road effects and even indication of infection from adjacent woodland. We had been watching the wild grapes for a couple years and in August 2014 noticed red leaf symptoms in wild grapes on the St. Helena Road in a location miles from any vineyard. Careful (but not rigorous) examination of this and many subsequent wild grape symptoms, which have also exploded in the last year, suggest that the source of infection is the road. Vines remote from the road are initially asymptomatic and infections always seem to begin at the road. Some time ago Dr. Golino demonstrated that wild grapes harbor leafroll virus and we took a poorly collected sample of these new red leaf symptoms to Mike Anderson at the Oakville Field Station. Subsequent work showed that GRBaV is indeed present in wild grapes. What remains haunting to us about the location of our first observation in wild grape is its remoteness, yet trucks from the vineyard discussed above and others have passed beneath this spot overhanging the road for years. If our intuition serves us, at least one vector must be capable of riding considerable distances on harvested grapes or machinery. When nearly every vineyard seems suddenly symptomatic, and when nearly every vine seems to show some level of symptoms, it is easy to consider a null hypothesis that the disease has always been latent and that drought stress or some other environmental variable is causing the current expression of symptoms. This hypothesis cannot be completely ruled out, but considerable evidence argues against it. This entry was posted in Biology, GRBaV, Red Blotch Disease, Wine and tagged Red Blotch, Red Blotch Disease, Red Vein Virus. Bookmark the permalink.